Growing indoors has become very popular in resent years. Not just for commercial farms, but for backyard growers as well. The ben efit of being able to grow what you want year round is a very appealing to many people, and growing indoors offers the grower the ability to completely control the plants environment. Being able to control the plants environment offers the ability to increase the quality of the crop, as well as the ability to produce maximum yields and bumper crops. The weather conditions outside can be unpredictable at times, and just about impossible to control. Especially in places that get snow most of the winter, and/or are very hot during the summer months if growing outside. Inside grow rooms (even greenhouses) offer the ability to provide the plants with the perfect growing conditions year round, as well as the ability to harvest multiple crops throughout same year. Although building your own indoor garden can seem complicated and expensive. With recent advances in technology over the past decade, and the prices of equipment being more affordable because of competing manufactures, as well as more and more extensive research developing better nutrient formulas, growing crops inside has become much more economical these days. For the particularly savvy deal hunter, even better deals on hydroponics equipment can sometimes be found at places like eBay and/or Amazon, though you’ll want to make sure the seller is reputable before you buy. And with the rising prices of produce at the grocery stores, more and more people are turning to growing their own food, and trying to make the most out of the space they have. When deciding on a space for an indoor garden, there are some important considerations to keep in mind. You’ll need easy access to pluming, including a good water source for mixing your nutrient solution with. A sink and drain for draining used nutrients, as well as washing and cleaning things. Good ventilation is also very important, plants need fresh air to breath, pollinate, as well as controlling high humidity that can cause diseases. Ventilation is also important controlling heat buildup in the grow area. Of coarse you’ll also need access to electricity for running pumps, lights, fans climate controls etc.. It’s also important todetermine how many lights you’ll need, as well as the wattage you’ll be needing to ensure you’ll have enough power, and wont be blowing fuses. Especially if the fans, pumps, heaters etc. will be on the same circuit. Once you’ve decided on a space for your grow room, the best thing to do is make a floor plan of your grow space. Draw out where everything is going to need to go, double check the layout, and see if you can improve anything and haven’t forgotten anything. Make sure to draw your floor plan to scale for accuracy, you can make the grow space the most economical and productive when everything is put down accurately on paper first (draw twice, build once). Next calculate the size of your grow room in both square feet as well as cubic feet. This will be important information needed to help determine the actual ventilation, amount of lighting, heating and cooling needed, and even co2 enrichment if needed and/or desired. Lighting your grow room can be done with either natural or artificial lighting. Depending on where your grow room is located, you may be able to take advantage of natural sunlight. Either completely, or at least in part with light coming in from windows, clear Plexiglas walls typically made for greenhouses, or by using skylights/sun tubes. If you still need to artificial lighting, there’s a wide variety of options (bulbs, wattage’s, spectrum’s, ballasts, reflectors, fixtures etc.) available. Artificial lighting is to wide a subject to be completely covered in this article, but here is some general information on artificial lighting for plants. Just be weary of retailers that want to sell you anything, lighting is the most expensive cost, and you don’t want to be buying it twice. Metal Halide (MH), and High Pressure Sodium (HPS), both are also referred to as High Intensity Discharge (HID) lighting, and are the most commonly used for growing plants indoors. Metal Halide is generally used for vegetative growth of plants, and has more of the blue spectrum of light. High Pressure Sodium is generally used for flowering growth, and has more of the red and/or orange spectrum’s of light. High Intensity Discharge lights also generate more heat than the other lighting options. This means that they need to be placed far enough away from the plants so they wont burn the foliage. They also need to be well ventilated so they don’t heat up the grow room to much. There is also Fluorescent lighting (T12, T8 and T5) and/or Compact fluorescent lights (CFL). These lights typically are best used for plants that have low light requirements like lettuce, and/or starter seedlings. Though with enough of them, and strategically placed, fluorescent lighting has been known to grow large plants. The main difference between the regular fluorescent and compact fluorescent is the ballast. CFL’s have the ballast built right into the bulb. Regular fluorescence’s have the ballast in the light fixture. They also produce much less heat than HID lighting, and also need to be placed close to the plants because the amount of usable light significantly drops off the farther away from the foliage they are. Regular fluorescent light tubes come in T12, T8 and T5 bulbs. The lower the “T” number the thinner the tube is, although the higher the light output the plants need is. But there progressively more expensive as well. Fluorescent lights come in blue and red spectrum’s as well, the color is measured on a temperature scale referred to as Kelvin (K). Bulbs marked 5000-6500K, are in the bluest range. Bulbs marked 2700-3000K are in the reddest range, and bulbs marked 3500-4100K are in the middle. Lastly, there’s LED lighting. LED lights produce the least amount of heat, but also need to be placed closer to the plants to be effective. There’s a large number of LED light manufactures on the market, but unfortunately there’s often a lot of difference in quality between one manufacture to another. Often LED’s are often sold with the claims that they will replace a particular wattage MH or HPS bulb, but this is rarely if ever true. Be aware of inexpensive LED lights, good ones are not cheep. Though cheaper ones may be fine for seedlings. Good LED lighting will produce good plants, but like fluorescent lighting need to be placed close to the plants foliage to be effective. 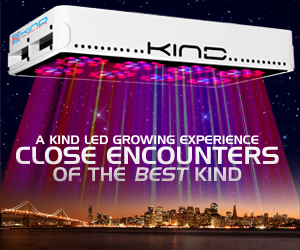 Increasing the need for multiple LED light panels/UFO’s the larger the plants are/get. Even for good LED light fixtures, they should be no more than 1 foot to 18 inches away from the foliage max. So even though LED’s use less electricity, the overall cost for good LED’s is generally higher than HID.